MS® LQ-PTFE Cartridge Filter, with its advantages of high porosity and high laminating strength, reached world first class technology. Membrane Solutions has developed multi-Hi-tech membrane products, including Ambient Temperature PTFE Membrane Filter Media, High-temperature Resistance PTFE Membrane Filter Media, and MS® LQ-PTFE Cartridge Filter for Wet filtration, to be Hi-tech transferable products. 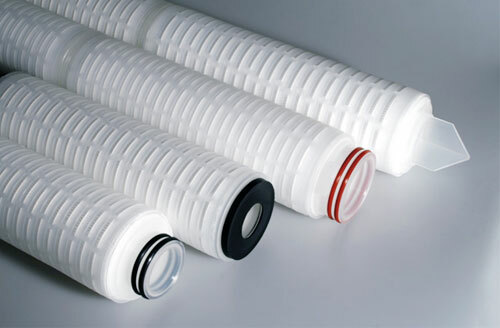 For years Membrane Solutions has been providing PTFE Cartridge Filter products to industries like water treatment, biosciences, chemical engineering, laboratory testing, food & beverage, electronics and pharmaceutical industries. End caps and connectors are sealed by thermal bond, free binder. Each is flushed with 18 MΩ water to ensure downstream cleanliness and rapid resistivity recovery.